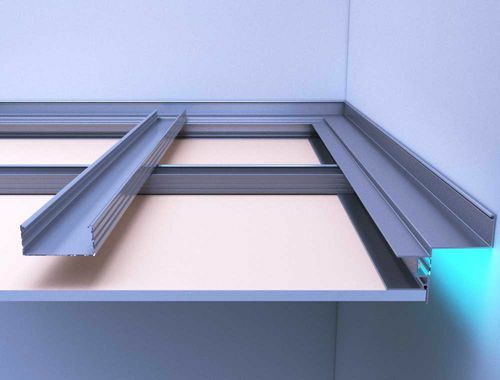 Salinox presents an innovative solution for the improvement of recess-making techniques on false ceilings, through an aluminum profile with numerous capabilities The aluminum profile is specifically designed to be placed on the perimeter of the wall. It bears a wing so that it is supported on the wall, sockets for the support of the supporting channels of the ceiling itself, and another socketed track creating a lidded chamber in which an LED tape can be placed. The chamber’s lid is made out of transparent plastic so that the light is dispersed through it. The profile’s innovative design has been patented by our company. (App. Number 20180100024).